The fantastic luxury boutique resort Karma Jimbaran is excellently situated on Bali's sought after southern peninsula, just a few steps away from the white sandy beach and the crystal-clear waters of Jimbaran Bay. Guests will enjoy some of the most majestic sunsets in the world. The luxury pool villas with one to six bedrooms feature an elegant, contemporary style blended with typical Balinese elements; the hotel offers a wide range of world-class services and amenities. Top-class golf courses can be reached within a short drive. A unique luxury hotel for discerning guests. The first Mövenpick property in Indonesia, Mövenpick Resort & Spa Jimbaran Bali, located only 15 minutes away from the Ngurah Rai International Airport. It is an integrated lifestyle destination which reflects the Swiss hospitality and Bali culture.This 5-star resort has 297 rooms and suites, one divisible ballroom and 4 meeting rooms. A total of 2,900 sqm multi-level swimming pool with activity zones are available along with kids club for different age groups, diverse family programs, 24-hour gym and the spa which reflects the vast Balinese and Indonesian spa and beauty culture.Catering to all tastes, six different dining settings are provided within the area. One of them is Above Eleven Sky Lounge & Bar, overlooking the Jimbaran Bay, serving Peruvian inspired menu for the perfect sunset experience. This residence is beautifully located on Jimbaran Bay, lying just a short distance from the beach. Guests will find themselves in a great setting from which to explore the area. A host of shopping opportunities and dining options are to be found nearby. Ngurah Rai International Airport is located just a 15 minutes' driving distance from the complex. 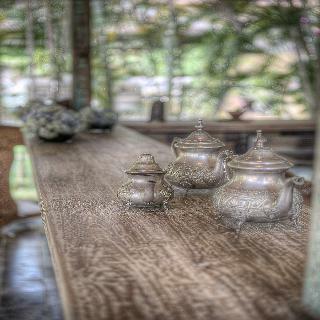 Comprising 8 villas, the residence embodies a minimalist style, which embracing the traditional character of Bali. The villas are eloquently designed, exuding poise and character. The villas are well equipped with modern amenities, affording guests a luxurious home away from home. Guests are sure to be impressed by the extensive array of facilities and services that the residence has to offer. This lovely hotel is in Jimbaran. With a small number of only 14, this hotel is very convenient for a quiet stay. Visitors may take advantage of the Wi-Fi connection throughout. Del Cielo Villa Jimbaran provides 24-hour reception. This hotel does not offer cots on demand. Del Cielo Villa Jimbaran is not a pet-friendly establishment. 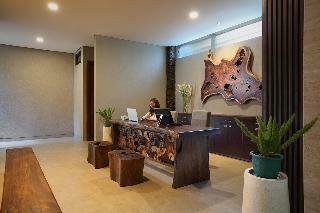 Del Cielo Villa Jimbaran provides parking for guests' convenience. 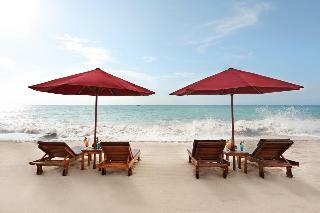 This well-kept complex enjoys a fabulous beachside location in Jimbaran. The lively town of Kuta with its many shopping and entertainment venues lies some 8 km away and it is 15 minutes to the airport. 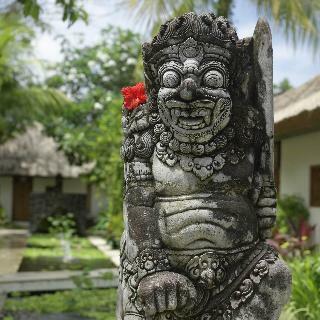 This complex has been decorated in a Balinese style and offers a cosy café, shops and a bar. 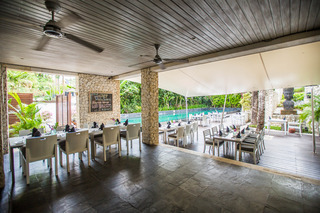 Dining options include a restaurant offering Balinese, Indonesian and international cuisine as well as a beachside restaurant with international dishes and seafood. The pleasant bungalows lie amidst wonderful tropical gardens filled with greenery and flowers. Each is air-conditioned and comes with a hairdryer, a minibar, and a hire safe. All bungalows come with a terrace and views out over the gardens or the sea. There is a freshwater swimming pool with sun loungers and parasols. Bali Golf Course is some 15 minutes' drive away. 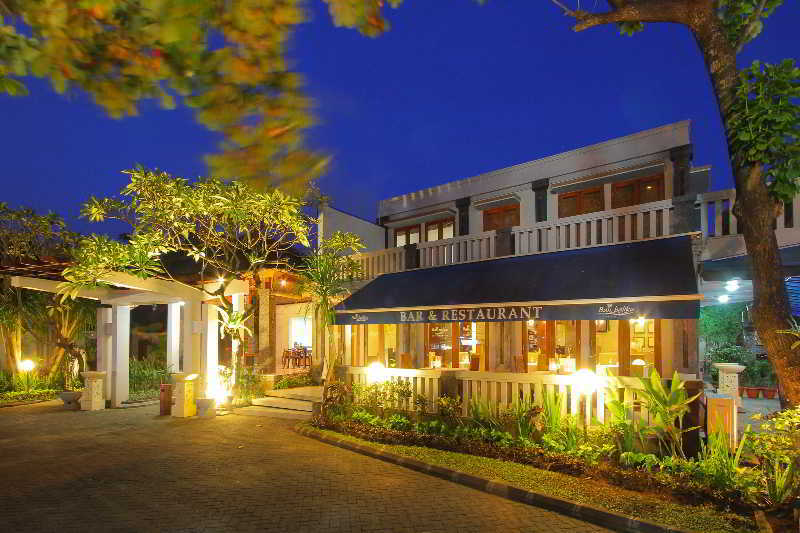 This enchanting boutique hotel is set in Jimbaran, just a short stroll from a long stretch of white sand beach. The beach is safe for swimming and is lined by popular beachside restaurants serving delicious grilled seafood, an excellent place to enjoy a drink and watch the spectacular sunset. The bustling Kuta Beach area is just a 15-minute drive away, and Nusa Dua can be reached in a ten-minute drive.Arranged around a traditional Balinese courtyard, the hotel's elegant guest rooms are richly decorated with rustic, antique furnishings, effortlessly draped silk and cotton textiles, and classic western fittings so that guests won't have to sacrifice modern comforts. Rooms can be regrouped into a same category room but remains unique. Guests might choose to dine in the in-house restaurant, serving local specialities as well as Mediterranean dishes, and relax with a massage or beauty treatment in the spa, all during a splendid getaway in Bali. Welcome to this oasis of peace at Jimbaran. 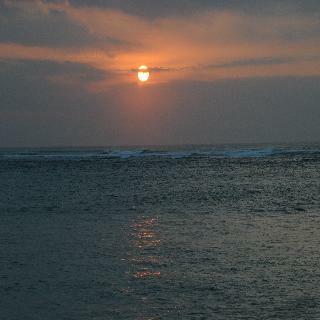 Its grounds cover about 1 hectare of beautiful landed bordered by a coconut estate, a mere 8 km from Ngurah Rai Airport. These delightful and stunning luxury villas afford peace and quiet for the most demanding travellers. Contemporary adaptation of a Balinese village has joined forces with modern minimalist architecture to create this sanctuary and the privacy of its individual villas. A great deal of attention has been paid to warmth, and the furniture and linen have been carefully selected using only first-class materials. Apart from the private swimming pools in each villa, there is also a public pool near the lobby. Other communal facilities include a fitness centre, a restaurant and a spa outlet, not to mention a spacious tropical backyard garden where you can relax. There is also pool bar and free airport transport services.